As it was written a year ago in our previous piece Hollywood Down, Liberland is a Balkan Trojan horse, used by the EU/US/UK administrations to increase the clashes between Balkan nations. It operates as a civil contractor, a sleeping agent, or a hired acting crew - whenever the official policies (both Western and local, governed by Western) go crazy or go completely awry, or when there are certain groups within Balkan nations which call on common sense to overcome any potential for future clashes, here comes Liberland, bringing to life new and completely insane ideas. After being publicly silent for quite a while, Liberland makes a new move. This time, the US/UK/EU Trojan horse organizes a conference in Novi Sad. The title is Liberland Conference: Constitution, Banking and Settlement. The conference is to be held on August 26-28th in the Park hotel in Novi Sad. Liberland announces the start of work of its air company (Air Liberland) and the conference is to be welcomed by Liberland's President and Minister of Foreign Affairs. Apart of being very silly guy, Liberland's President Vid Jehlička looks like a real promoter of the US liberal type economy, but more precisely, a multilevel marketing concept – the promotion of a country, its airline company and its staff would not lose the opportunity to make money from visitors. Actually, it looks like the point is to make money from visitors – another liberal way to rip off citizens from the countries which the US/UK/EU already steal a lot from and continue to do so. Also of course to satisfy the capital behind of the event. Multilevel marketing is of special importance as it serves various US religious sects to operate through. It is well known that Scientologists, Jehova's Witnesses and Mormons establish companies and, whatever the companies do, it uses the model of multilevel marketing and someone from the management appears to be a pastor of some obscure American sectarian church, which sometimes uses liberal economics and pop culture to hide behind. So, why should someone be against smiling faces, lots of fun, promotion of a new air company, nice young people, fighting for freedom, networking, mingling? All of this is another sick Hollywood style show, organized in the circumstances of higher pressure on the Balkans: Croatian Government's embarrassing Ustasha policy as official – although Croatia is part of EU and EU says it is against fascism and its various manifestations; then, the announced referendum in Republic of Srpska which the West does not like at all, as well it does not like the President of Republic of Srpska, Milorad Dodik, who does not have any problem to slap in the face the Western politicians in The Balkans who tend to interfere in the internal issues of the entity. Then, the Western puppet Government of Serbia, which is opposed by the majority of the citizens of Serbia. Then, terrorist, drugs and human organs dealers who are protected from the responsibility in front of international law by being appointed at the main positions in the false, self-proclaimed “state” of Kosovo. Then, Macedonia, which has been under a silent occupation by the US since the '90s, but, somehow, it is easy to produce another colour revolution there. Then Slovenia, which has recently been paid a visit by Russian President Vladimir Putin. Liberland is deployed, again, in the continuous net wars in The Balkans. Although Park hotel is a private property (appears connected to Rothschilds' properties) and, according to the free market set up, can rent its space or host any event which it finds good for the business, the question arises: is there anyone of the local Novi Sad, province or republic authorities to check out what is happening on the territory of The Republic of Serbia? 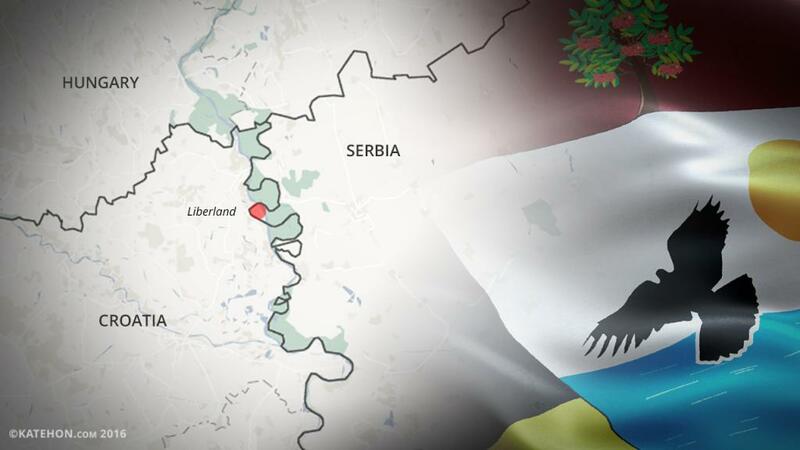 Does Serbia intend to recognize Liberland as a state? Is it a Western staged way to bring to the consciousness of the public that a state can be founded and may exist just because someone says it exists and it is a state? Because it has propaganda machinery and several state-like symbols? And, in some cases blood-thirsty assassins, in other cases harmless clowns? It is obviously a new fashion: Kosovo, Daesh, Liberland, South Sudan, Kurdistan-in-the-making. Those states are made either by conventional, unconventional/net wars or building a website, several social media accounts and renting a house, put a plate with the name, and go partying or multilevel conferencing? There are only two ways to understand this phenomenon: it is either all legal and those states should be formed by fulfilling international norms and be recognized by all the relevant institutions of international community and by the majority of world states and everything is fine, or it is all illegal, and those who push for the foundation of such states know very well it is illegal and that is why they deploy different means, in order to somehow achieve the illegal goal – by illegal, but also legal means. And, again, the same old hideous Western tradition: as things go completely out of control in The Middle East, in a hundred years war for Greater Israel, the West refocuses on the Balkans. After major wars and lots of death sown in the Middle East, it is time for a little bit of fun in a silent net war in he Balkans, Liberland is the host, but where? On the territory of another state.